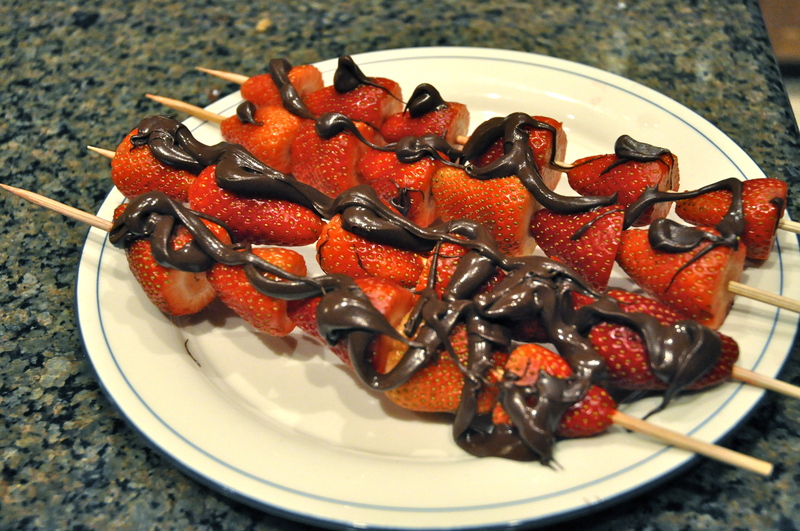 How can you go wrong with strawberries and chocolate? 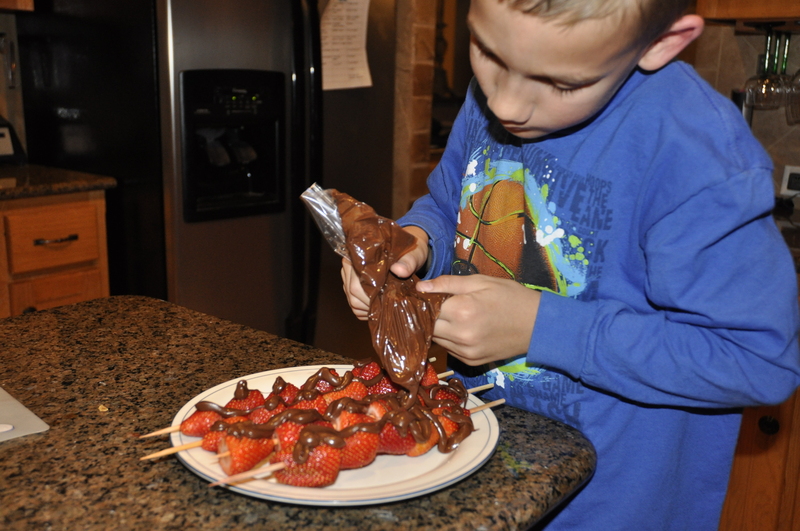 Especially when you see the smile on your baby’s proud face for his culinary masterpiece! 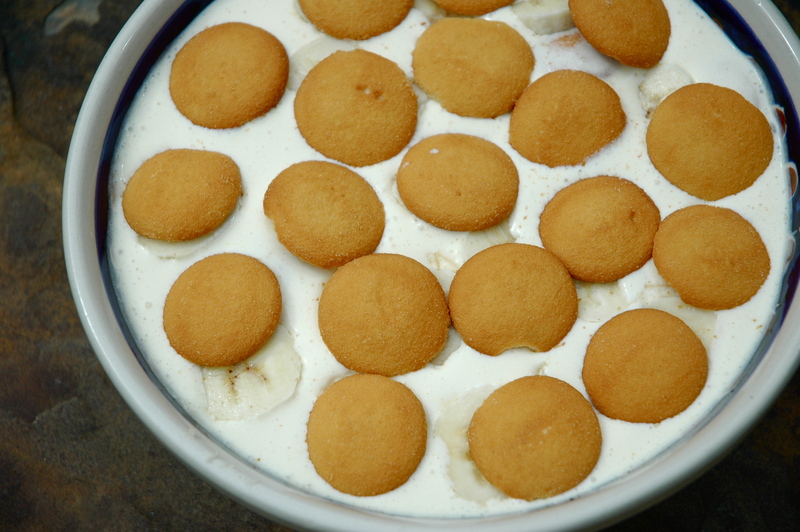 This is no ordinary Banana Pudding! 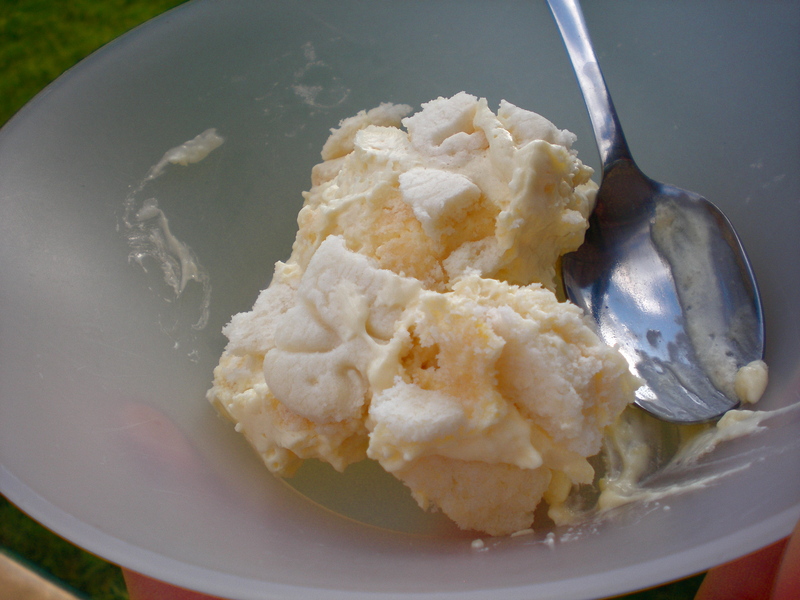 It’s the best ever, and it’s the kind of dessert that makes people amazed at the first bite and run to get the recipe on the second. The secret ingredient is the can of sweetened condensed milk, which adds plenty of creaminess and rich sweetness. To make this gluten-free, you just need to use GF animal cookies instead of Nilla Wafers. I usually make two versions with both kinds of cookies, so everybody’s happy. But, I’ve been told that the gluten-free kind is just as good. It’s really not about the Nillas anyway when you taste this pudding. Mix all ingredients together until smooth and fluffy. Layer cookies, then bananas, then pudding in a large bowl. You’ll do this 2 or 3 times. End with a layer of cookies. It’s extra good if you make it a day ahead. Refrigerate until ready to serve. I use KinniKritters Animal Cookies for our gluten-free pudding and Nilla Wafers for the regular pudding. 2 boxes Betty Crocker gluten-free yellow cake mix, plus ingredients to make it. Make cake mixes in a 13×9 or 2 round cake pans. Let cool. Using a fork, poke holes every 1/2 inch all over the top of the cake. Mix powdered sugar and lemonade concentrate together, then pour over cake. Top with white icing. In all my years of gluten-free eating, I have never been brave enough to serve a gluten-free cake to all my “normal” guests. I just couldn’t make them eat my gluten-free, slightly dry and crumbly version, when I could have treated them to a good old-fashioned Chocolate Sheet Cake, or “Mama Cake” as we call it in our family. With this recipe though, I can make one cake, and have everyone ooh and ahh about how moist and delicious it is. Though I’ve posted it before, it begs repeating, because this time I added icing and made it into a layered cake. 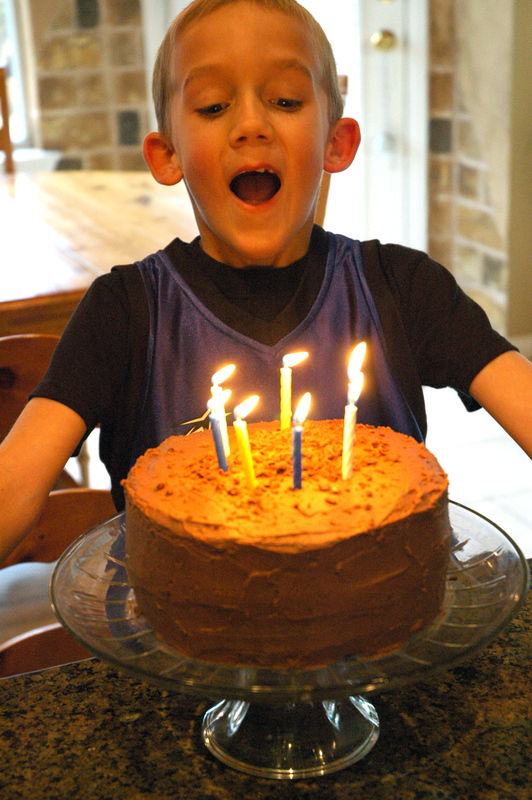 It works as a beautiful birthday cake with chocolate frosting. It also works with colored icing for a kids’ cake. 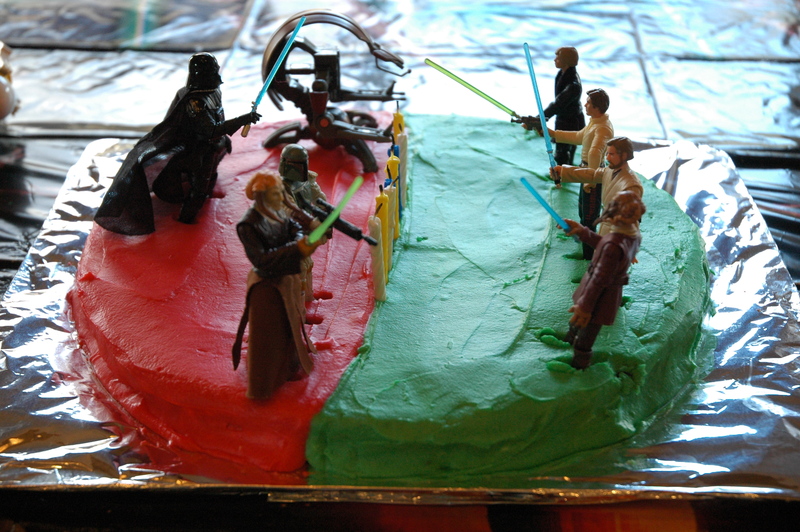 This one was a Star Wars battle scene created my son. If you have any leftovers, remember that you can freeze individual servings. 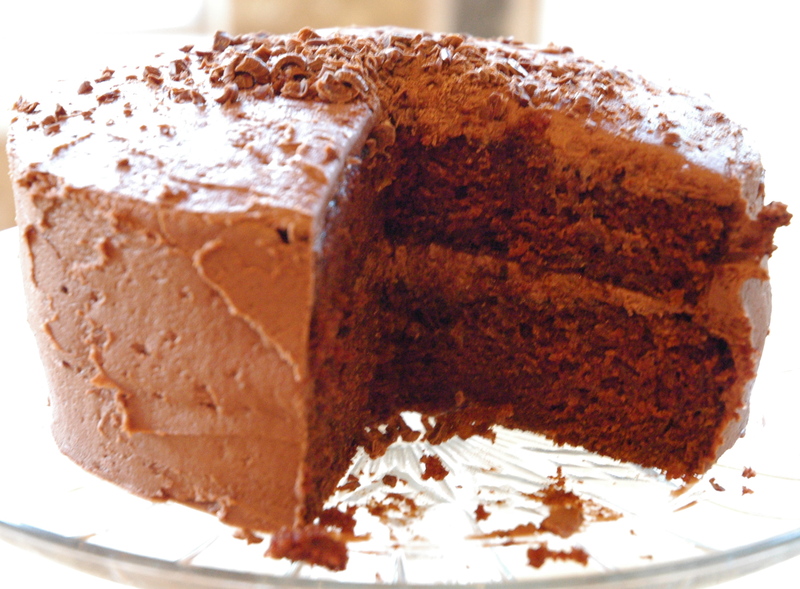 Chocolate cake on demand is a very good thing. I tried to make cinnamon rolls, I really did. 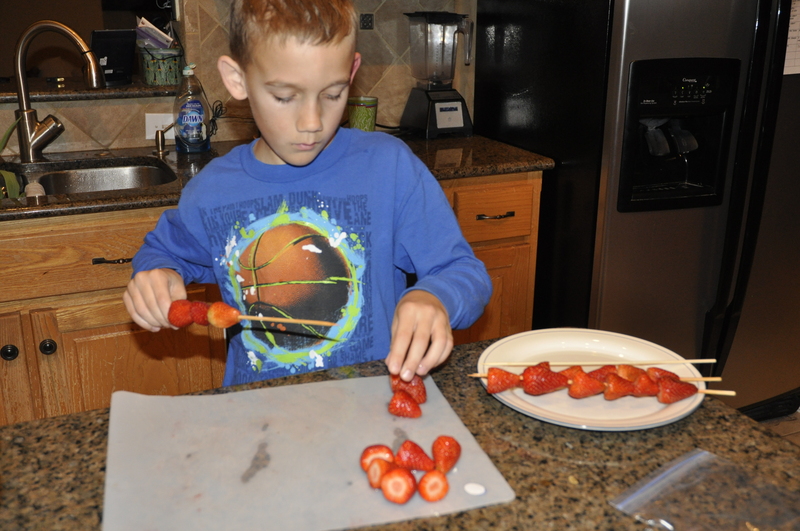 I thought I was up for it – all the rolling and spreading and then cutting and baking. I mixed the dough and let it set to rise. And I waited and waited. The dough never moved. It was dead dough. But, being gluten-free, it was expensive dough. And, we don’t waste gluten-free dough around here. So, I improvised. 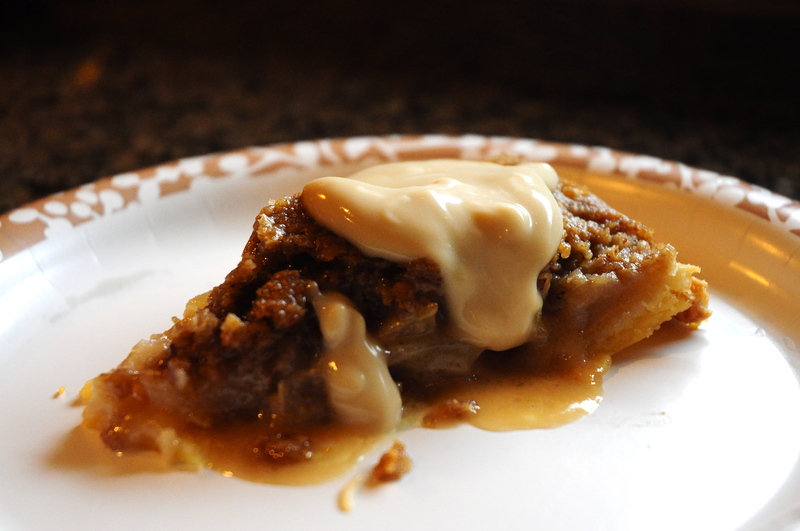 I figured if you smothered it with enough butter, brown sugar, and cinnamon, it would taste just the same. And I was right! Which means, that from now on, I declare the actual cinnamon roll to be an excessive amount of work on my part. From now on, we will have Monkey Bread instead, and we’ll all be happy. The End. To make Monkey Bread, start with gluten-free dough. You can make the cinnamon roll dough from this post, or even though I haven’t tried it yet, I think you could also just use a bread dough or even a mix. 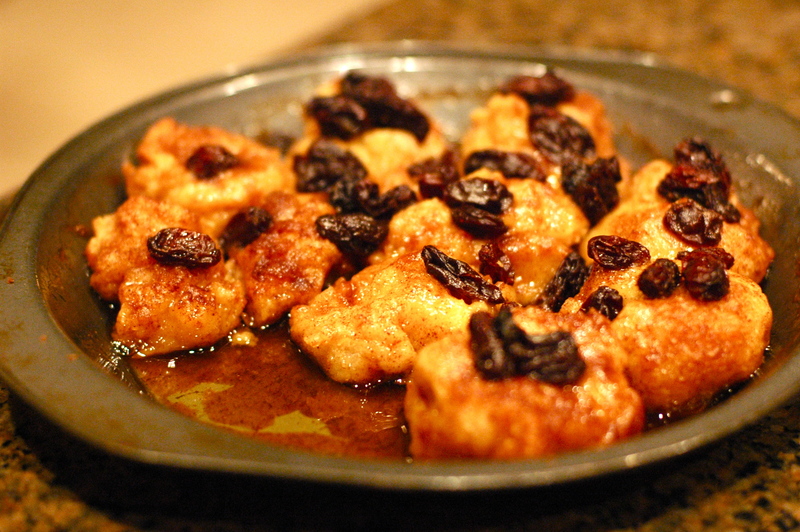 That would even increase the beauty of the Lazy Monkey Bread. Melt some butter in one bowl, and mix some brown sugar and cinnamon in another. Roll the dough into pieces a little smaller than a golf ball. Dip each piece into the butter and then into the sugar mixture. Place into a baking dish, and bake at the temperature suggested for the bread you’re using until they are golden brown and cooked through. And then, eat some as fast as you can before your family gets to them. They’ll be gone so fast, you won’t even have time to take a pretty photo of them outside of the pan. 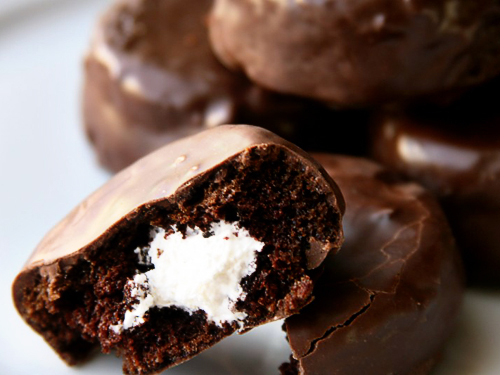 Deliciously Dandy Ding Dongs can be GLUTEN-FREE!!! 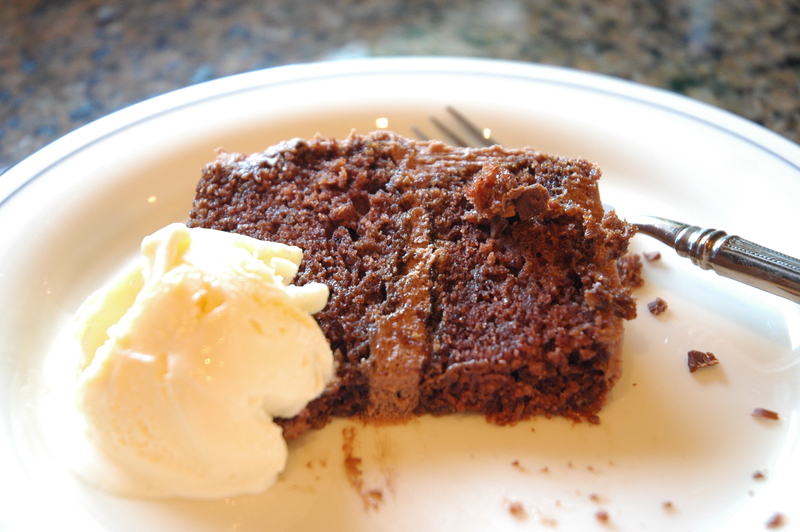 Just use the new Betty Crocker Chocolate Cake Mix or my favorite gluten-free chocolate cake recipe as your starting point and follow this recipe from there. 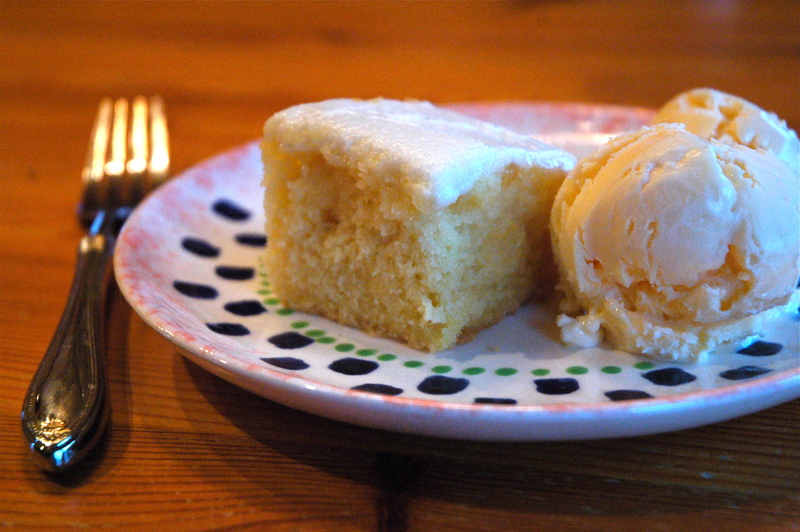 I love it when we can add another “off-limits” treat to our list of yummy gluten-free desserts!